In the midst of a national doctors' strike, Nigerian authorities are now working to prevent an outbreak of Ebola, after the country’s first patient died last week. The strike leaves Nigeria's hospitals unprepared to treat or contain the disease if it begins to spread. Doctors said Nigerian hospitals were in a state of near collapse, and they would strike until the government supplied them with enough resources to adequately treat their patients. Analysts said in terms of hospital needs, the doctors were right. “Some of the equipment they use are obsolete. Researches are not implemented and actually they are not proactive,” said Okeoghene Eboibi, who heads the engineering department at Delta State Polytechnic. He said the state of the hospitals was all the more frightening since the threat of an Ebola outbreak emerged in Nigeria last week. Patrick Sawyer, a Liberian official, flew into the country from Liberia early last week. His plane stopped in Ghana and Togo before he arrived in Nigeria, where he was quarantined immediately. A few days later, he died of Ebola in Lagos, a crowded mega-city of 21 million people. Ebola, one of the world’s deadliest diseases, has killed nearly 700 people in West Africa since an outbreak began early this year. Eboibi said if it spread to Nigeria -- Africa's most populous country with many crowded cities -- the result would be terrifying. “I’m worried for big cities in Nigeria like Lagos, Abuja, Kano, because government may not be able to control the outbreak if it’s not prevented,” he said. Officials said they were trying to prevent an epidemic by locating all the people who came into contact with Sawyer. So far, they have found 59 people that had contact with him, and none have yet tested positive for Ebola. 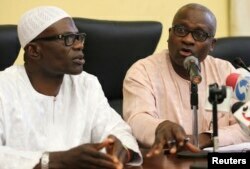 (L-R) Lateef Aderemi Ibirogba, Lagos' State Commissioner for Information and Strategy, sits with Dr. Jide Idris, the Commissioner for Health, during a news conference on the death of an Ebola victim in Lagos, July 25, 2014. But Lagos State Heath Commissioner Jide Idris said many more could be out there. “In collaboration with the Federal Ministry of Aviation I've also put into motion mechanisms to track down all contacts at high risk,” said Idris. He said the government was also trying to prepare for an outbreak, by screening travelers when they entered the country, by spreading information about the disease to the public, and by building an isolation unit in Lagos. Outbreaks of Ebola are life-threatening and in up to 90% of cases, people die. But these tasks are complicated by the refusal of doctors to end their strike, which began nearly a month ago. Atonyebe Oyede, a Nigerian civil servant, said the government was doing everything it can, but preventing the spread of the disease amid the chaos of Nigeria’s health care system would require an act of God. “You see that this Ebola outbreak, other African countries we have experienced it, but here in Nigeria we live by faith,” said Oyede. The Nigerian Medical Association says if there is an outbreak, the union has “structures in place to respond to emergencies.” But with doctors themselves getting the disease in other countries, many Nigerians also wonder, if there is an outbreak, if an end to the strike would be much help. Hilary Uguru contributed to this report from the Niger Delta.